AND THEN YOU OWN ONE! Abercrombie & Fitch Co. (A&F) sells apparel for men, women and kids under the Abercrombie & Fitch, abercrombie, Hollister, and Gilly Hicks brands. 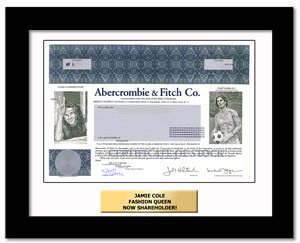 One real share of the popular All- American apparel company, Abercrombie & Fitch.